What will be the next algae foods and recipes and the future uses of algae as food and feed ingredients that will transform our health and our diet? Create menus, new foods and food products incorporating algae as a featured ingredient. Open to algae enthusiasts, chefs, cooks, food developers, algae eaters, students and teams. • $50 for companies, entrepreneurs, professionals, teams. • $25 for individuals, students, not working for pay, temporarily unemployed, NGO personnel. • $00 for scholarships by invitation: no charge. Many people have no idea how many everyday products already contain algae. 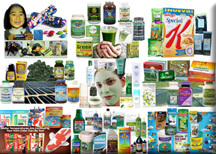 See some of the many products with algae. • Algae Products Today – 21 page pdf file (8 MB). Microalgae like spirulina, chlorella and blue green algae are available in the form of dried powder, flakes, capsules and tablets in health and natural food stores, online stores and through network marketing. Macroalgae like nori, wakame, dulse, kelp and other edible seaweeds are available in sheets and flakes in stores and served in Japanese and other Asian restaurants. • Fresh Spirulina Aquamole Recipes Sample Presentation – 10 page pdf file made from Powerpoint (4 MB). • How to Eat Fresh Spirulina Algae in Aquamole Dips. – 4 minute video. An international judicial panel with substantial expertise in consumer behavior, food and restaurants will select finalists. The judicial panel may prepare recipes and perform taste evaluations.